Because Riesling is literally the wine equivalent of that friend that gets along with everyone, Wines of Germany is teaming up with a bunch of different (but awesome) restaurants and bars across Miami, New York, Los Angeles, Charleston, and Austin to present The Summer of Riesling. Pizza? There's a Riesling for that. Raw oysters? There's a Riesling for that. Fried Chicken? An omelet brunch? You get the idea. These restaurants will be pouring at least two German Rieslings by the glass through August 31st, offering special flights, pairing menus, and more. Read on to see where you should kick off your Summer of Riesling with the wine that keeps on giving. The “genuine” in the name isn’t just for show here, as James Beard Award-winning chef Michael Schwartz puts a big focus on local and sustainable ingredients that contribute to their ever-changing schedule. Some constants include their fresh raw bar and some new inventions, like breakfast pizza at weekend brunch. Pubbelly offers a more refined pub experience with fare that includes short rib tartare with goat butter toast, “chopped” bone marrow with bacon remoulade, and duck confit ravioli. Hakkasan’s menu is helmed by chef Tong Chee Hwee, the only chef to earn a Michelin star for Chinese cuisine in the UK. Like all Hakkasans, their Miami location has the decor of a luxe underwater Chinese nightclub, but don’t let that fool you: food comes first here. Mixing modern and traditional Cantonese influences, Hakkasan surprises, with dishes like stir-fried lobster and roasted duck in kumquat sauce. Yardbird describes their brunch as a “foot-stompin, soul-healin’” experience, so you know they take Southern cooking seriously at this place -- though the menu with items like maple-glazed bacon doughnuts and the fried green tomato BLTs helps drive home that point too. Not only does farm-to-table restaurant Market 17 create everything from scratch and has a daily changing menu, but the restaurant’s sommelier owners offer a “Dining in the Dark” program, where guests are invited to taste exclusively-prepared meals and wine from their 350-item strong list in pitch black to help people experience taste in a whole different way. This cozy wine bar takes their love for the grape juice very seriously. Their entire front-of-house staff consists of trained sommeliers, the bar hosts tastings for their monthly wine club, and their entire menu is developed “backwards”, building the food around the wine selections. Key lime pies and fried green tomatoes at Whisk help remind you that the tradition of Southern gourmet is going strong, even down in Miami. Thanks to their exceptional comfort food and catering, Whisk has quickly become a South Miami favorite. They were even featured on Diners, Drive-ins, and Dives, where Guy Fieri devoured a whole fried fish in peanut sauce. 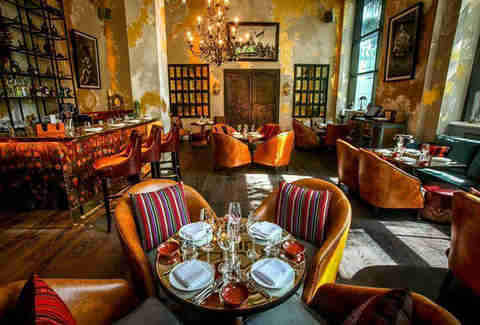 Coya’s design evokes a sort of luxurious Incan lounge, yet with a downtempo vibe that doesn’t stress you out. An import from London, Coya’s Peruvian menu features dishes like sea bass ceviche and a Pisco bar serving twists on this particular cocktail. Hang around enough and you may be granted access to their private member’s lounge. A restaurant concept from NYC Chef Damon Wise and brand marketer Jonathan Buckley, Scarecrow & Co. is set to open in the coming weeks in what was an old train depot. The restaurant will focus on wood-fired entrées that center on Lowcountry’s produce, which also inspired the venue’s name. A Charleston venue so historic that George Washington was literally served a 30-course meal in the restaurant, McCrady’s offers new, modern takes to Southern fine dining, with a focus on local, sustainable ingredients. A full-service restaurant and event space that’s known to locals for its killer brunch, Cannon Green’s menu is Mediterranean-influenced and highlights the pastas, breads, and cured meats that are all made in its kitchen. An upscale neighborhood wine bar that isn’t stuffy, Stems and Skins has a varied wine selection and craft cocktails, plus they have a nightly selection of charcuterie, cheeses, sandwiches, and Mediterranean small plates. Oh, and they also spin vinyl behind the bar. High Cotton is an upscale local favorite, serving up Lowcountry dishes with a few twists. Its seafood dishes make your mouth water, plus they have a “high steppin’” cocktail menu with some great options. Yes, upscale barbecue is a thing, and Poogan’s Smokehouse does it right. Serving ribs, pulled pork, and smoked sausages in an industrial loft venue, Poogan’s also features some drool-worthy Southern mains, like shrimp and grits with a red-eye gravy and fried chicken with white cheddar mac and cheese. If you’re looking for a good place to get your Mexican fix, you’re at the right place. Minero’s uncluttered yet colorful décor lends a great atmosphere in which to chow down on a generous variety of tacos like the traditional al pastor or green chorizo, and kick back with a Modelo Especial or a Bloody Maria. Here you’ll find a full seafood menu sourced from local fishermen, crabbers, and oyster farmers. Seated in sleek yet slightly distressed dark wood booths and surrounded by subtle nautical décor, enjoy a feast of crispy oyster sliders, scamp grouper with porcini ragout, or a shellfish tower from the oyster bar. Located in the carriage house of a Charleston mansion, Circa 1886 is considered one of the most romantic restaurants in the city, and it’s got a pretty swoon-worthy menu, too. The dishes are inspired by traditional Southern fare, like the chicken-fried lobster with grits and jalapeño cauliflower jardiniére. This steakhouse is located on Kiawah Island, a barrier island off the coast of Charleston that operates as a beach resort. They specialize in preparing local, grass-fed beef from a South Carolina farm, which you’ll enjoy with oceanfront views. Plus, there are oysters and caviar, if you’re feeling really fancy. Located at the brand spanking new Dewberry Hotel, Henrietta's offers a contemporary take on traditional Southern decor with its caned ceilings and veranda-style seating. Its locally-sourced, Southern-inspired French menu is sure to please even the finickiest of eaters. Head to the downstairs cocktail bar and check out ACME’s diverse wine list with a focus on Old World styles. With the small-plate options and select dishes from the restaurant, you might just end up staying down there. You’ll have several menus to choose from (breakfast, weekend brunch, lunch, and dinner), at this Asian fusion resto in the Mandarin Oriental Hotel. So depending on when you choose to nosh, you’ll be able to sample foie gras terrine as an appetizer before the Wagyu beef tenderloin. It’ll be hard NOT to feel like you’re in Deutschland after you set foot in this stag antler-adorned German restaurant. Kick back and admire the taxidermy while eating the wine-braised lamb goulash with spätzle and sour cream you’ll be craving regularly after this visit. You can come to the Russian Tea Room and just feast your eyes -- you’ll walk out full. 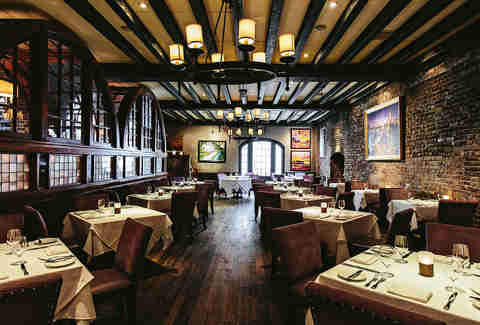 But this 80-something-year-old New York institution also boasts an incredible vodka selection, fine dining, high tea, and wine list that runs the gamut of prices and styles, so… feast your mouth too. Craft beer, giant windows, small-batch ingredients, a view of the High Line? We can keep going. How about a 71-page wine list? Colicchio & Sons is a business that means business, but for some reason you’re still here, reading, when you could be there, drinking. While this one might be harder to pronounce, you’ll have your mouth too full to care anyway. The charcuterie (consisting of items like black truffle sauccison and duck prosciutto) and cheese plate alone are worth the trip, though the raw Hudson Valley beef with Saigon sauce or the lamb shank with toasted couscous are also hard to say no to. The wines, charcuterie, and sammies are great but don’t miss the wine class (which includes cheese and bread!) taught by seasoned somm Laura Maniec and her team so you impress your friends at the next dinner party. The Gramercy Tavern can be enjoyed in two ways: the Tavern, and the Dining Room, both of which offer seasonal, contemporary American a la carte menus. If you’re looking for a relaxed atmosphere to get a bite to eat or have a drink, this is the place to be. Want to experience the cuisine of a Michelin Star-winning chef with over 30 years’ experience? Yeah you do. Günter Seeger’s passion for daily-changing menus consists of locally and respectfully sourced ingredients served in a laid back space. 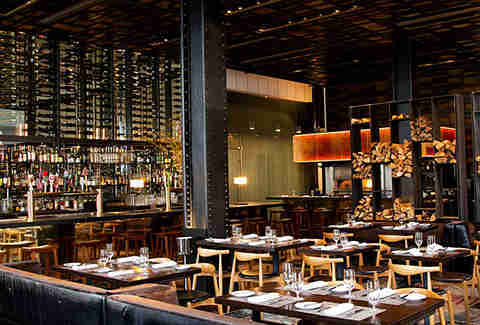 Pretty much the definition of NY fine-dining, Jean-Georges is French cuisine honed to a fine point. Those three (!) Michelin stars speak for themselves. Junoon’s vibe is that of an Indian palace, and it's got the food to match. Their near-universal acclaim comes from inventive dishes like lobster curry and salmon kebab, plus they put in the work to build a massive wine list. From the rooftop to the Atrium to the library (whaaaat), you have a carte blanche when it comes to where you want to (elegantly) chow down at the NoMad Hotel. Want a little bit of everything? 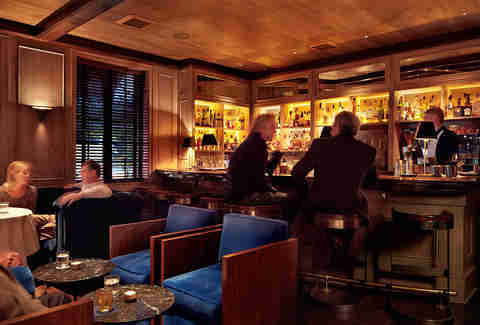 Sidle up to the NoMad bar and dip into the upscale pub fare, classical cocktails, and wine list. If you want a wine bar that doesn’t take itself too seriously – but takes its wine and soccer very seriously -- then this is where you need to be, especially because it has the most accessible cheese menu ever (the cheddar is listed as ...damn this is tasty cheese). 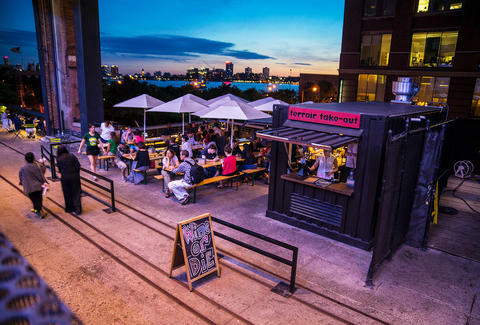 Terroir on the Porch is not unlike Terroir in terms of tastiness and vino, but has the added benefit of crazy river views, outdoor dining, and a menu lighter on food but heavy on drinks. A walk away from the MoMA, Má Pêche serves up à la carte options, classic cocktails, and 56 selections on their wine list, each bottle available for $56 -- who doesn’t love thematic wine pricing? A brick oven imported from Italy is the centerpiece of this resto where guests can see the food being prepared (and smell it too). Opt for a stuffed wood-fired sandwich (a puccia) full of prosciutto and warm goat cheese, or just stick with a classic Margherita pizza. Feelin' Italian? You're obviously in the right place. Not feeling Italian but outnumbered by your friends? That's cool too -- Pignetti's has classics like meatloaf and shepherd's pie -- though you'll probably all agree that a wine list of 1,300 selections from all over the world is pretty impressive. Featuring Italian comfort food for whatever mood you're in, this place has pizzas by the slice if you just want to go grab and go, or you can sit down and enjoy cozy pasta dishes like classic spaghetti and meatballs instead -- even if you only eat gluten free. Yup, there's an entire menu of gluten free pizza, pasta, sandwiches, and more. What goes better with Parkside's serious oyster platters that boast East and West coast varieties? Well, their daily half-off happy hour is a given of course, but we'll have to give it to their wine list that is impressively sorted by taste, which is pretty freaking sweet. Whether you fancy a "light & crisp" white with your bivalve or a "full & intense" glass, you'll find the right white to sip as you slurp. Instead of confining yourself to a single dish at this modern Thai restaurant, round up nine of your closest friends and try one of their group dining options like the moo sway to get a taste of the full spread. With a weekly changing menu, if something looks good today at Otto's, you better grab a seat before it's gone tomorrow. And since you're smack dab in wine country, your drink will more than measure up to your wurst platte… if they're serving that tonight, that is. Looking to taste wines from a wide selection? Red Room's got your back. Just grabbing wine to go? Red Room's got your bottle. If you want anything from a sommelier consultation to a private locker to store your wine (with 24hr security!) to bites from Vince Young Steakhouse, well, the address is right there. Tubby’s takes a bare bones approach to their food, serving up Latin street-style food in a small shack with patio-only seating. But don’t let that fool you -- the empanadas are top notch and they can surprise with dishes like chickpea fries. Plus, there’s a playground! Perla’s, which boasts one of the prettiest patios in all of Austin, is a big and bright seafood and oyster bar on South Congress. Its fresh fish and oysters are flown in daily from the East and West coasts, and is complete with cocktail menu inspired by coastal offerings. Jeffrey’s is a fine-dining restaurant guaranteed to make you feel fancy, with lounge chairs, fire places, and mood lighting throughout. Its menu is filled with high-end, French-American classics, like the 26oz Texas wagyu bone-in rib eye that’s dry-aged for 32 days and topped with foie gras butter. Located lakeside at the Four Seasons Hotel, Trio’s mesquite-smoked, 14oz prime rib-eye is considered one of the best steaks in Austin. Its menu is centered on the steak and seafood classics, and its brunch is a splurge, featuring a gourmet buffet to go along with your mimosas. As a beer haven, Whip In does not disappoint with their rotating selection and 72 drafts on tap. Their food is described as Indian fusion, but this place covers pretty much every base, functioning as a catering service, a wine bar, and even a small grocery store. Located in a bungalow behind its sister restaurant, Jeffrey’s, Josephine House has an eclectic menu that changes daily, which means that steak-frites Mondays are indeed a thing. If you’re still hungry for dessert (which, uh, you better be) they also make their own ice cream. At Lake Travis Wine Trader, the wine tasting ranges from a decently priced bottle to rare vintages, and also includes a menu of cheeses, olives, nuts, and lunches to compliment their list. What’s better than sipping on wine in the garden? If it’s the right wine and right place -- pretty much nothing. 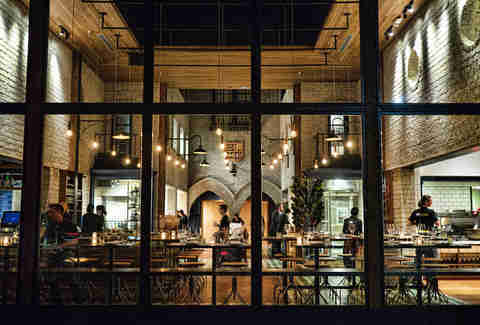 And Lenoir is the right place, offering drinks and small plates in their backyard wine garden while serving up a variety of dishes inspired by local ingredients from their main kitchen. Until humanity gets its hands on a time machine, placate yourself by drinking history instead. Augustine Wine Bar offers very rare, older wines by the glass (which is a pretty big deal! ), so you might end up sipping on a vintage older than the Great Depression. The super laid-back Baldoria espouses a “come as you are” attitude towards its patrons, aspiring to blur the line between restaurant and bar by its communal dining spaces and shared plates alongside signature cocktails. No menus? No worries. The staff at Bar Covell will set you up with everything you need to know about which wine to choose from their 150 option-strong wine list, featuring little-known wines from around the world. If you can manage to find a spot at this ever-popular Italian spot, order a charcuterie plate to go along with your wine -- everything is cured in house at this converted downtown warehouse run by a husband and wife duo. This sprawling space is very old Hollywood -- if 30ft gold ceilings and lavish art deco design is old Hollywood to you. Not only does Cicada host swing dance and vintage club nights, but it boasts a Northern Italian fusion menu with desserts like pistachio creme brûlée or a fruit and cheese plate you’ll have fun trying with a sweet dessert wine. On the date-night spectrum, you really can’t go wrong when you plop a big ‘ol tree in the center of your patio and throw up some string lights. But with offerings like foie gras, crispy octopus, a super serious cheese list and an even more extensive wine list, Cliff’s Edge cements their spot as a must-visit -- tinder date or no. While you might opt for their seriously popular rib-eye steak, don’t forget to check out their winemaker dinner series, where you can dine with different winemakers representing wines featured on F&F’s award-winning wine program (with a special dinner menu curated just for the event). In terms of critics’ reviews, Kali is the teacher’s pet, wowing foodies with its organically sourced menu items like cold asparagus and nettle soup, pork loin, and almond panna cotta for dessert. A small neighborhood oyster joint with a sweet patio, L&E Oyster Bar gets their oysters shipped daily, and offers them raw, grilled, or fried -- along with other small dishes like clam chowder, oyster po’boys, and avocado salad. Looking through Providence’s photos of food might make you forget that other foods besides seafood exist. There’s a lot to say about this place -- star chefs, James Beard awards, Michelin stars -- but the shots of lobster and striped bass on their website speak for themselves. If relinquishing your wallet to the staff and simply spending the entire day eating at Republique isn't the most realistic game plan for you these days, stop in just for dinner and make sure to chat with their somm about wine options that stretch far beyond what's on the menu online. Salt's Cure's philosophy is "if it's not within six hours of the restaurant, it's not on the plate"; ours is "if you're not within six hours of the restaurant, get moving". Go in before dinner to start with their anti-gridlock hour menu (how thoughtful of them!) and then just keep going. Scopa Italian Roots serves up -- don't be shocked -- a classic Italian menu. And because they've got a no-outside-wine rule, when you sit down to that plate of tagliatelle, consider consulting their spirits menu, otherwise known as "the field guide to navigating the giant wall of booze." If you're getting Spanish cuisine anywhere, go to the top of the tapas; the Bazaar by José Andrés is mixing traditional Spanish flavors with innovative culinary techniques. Who says you only ever have to drink beer at a brewery? The Hermosillo offers snacks, entrees, and a cheese & charcuterie plate along with a wine list. Bar 1886 makes drinks the way they were made during Prohibition -- except, you know, legally. Expect old-school attention to detail and craft, and don’t be afraid to ask the bartenders to surprise you.